What’s a birthday without something sweet? Sure, I made cupcakes for J, but you got to have ice cream with cake, right? After lunch and a quick shopping trip, J wanted to get some ice cream before heading home for the evening. 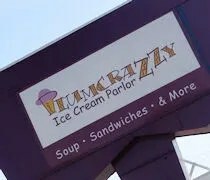 We’ve been talking about going to Plumcrazzy Ice Cream Parlor on South Westnedge just south of Pierce Avenue in Kalamazoo’s South Westnedge neighborhood. 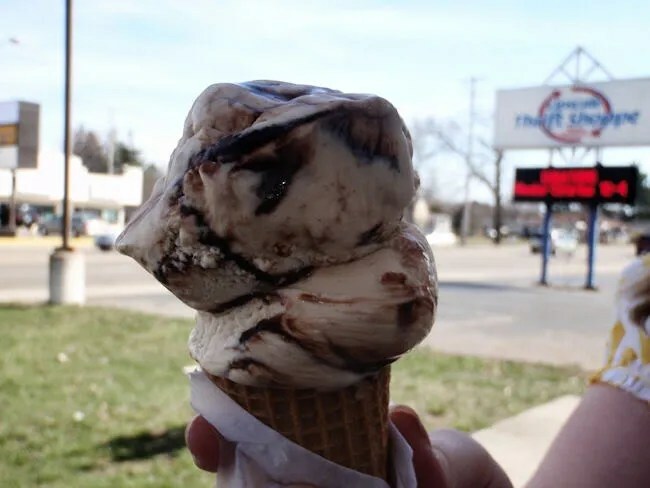 The stand-alone ice cream joint just screams happy. It’s painted with purple accents and the inside is well-lit with large windows letting in a lot of natural light. Even though it was later in the afternoon, the place was empty. We were greeted by a man standing between two ice cream coolers as soon as we opened the doors. Plumcrazzy does more than ice cream, but we had already eaten lunch. Their sandwich menu is mostly a build your own thing, but they also have BBQ pork, chicken salad, hot dogs, chili dogs, a reuben, a BLT, and chili. J walked up and down the case looking over the Plainwell Ice Cream flavors. She settled on Peanut Butter Fudge and got it in a small sugar cone. I was going to go with a shake, but after complaining about a price I thought was high this weekend, I thought better than to pay more than that other price. Instead, got a scoop of Oreo in a dish. Both of our treats came in a quarter under five bucks. Had I gotten that shake that I wanted, I would have paid more than that just for mine. We headed out to a table in front of the store and still tried to enjoy the incredible spring day. There are seats inside, but just outside the store are a couple of metal tables and a trash can or two. Both of our ice creams were really delicious. Mine was a classic cookie’s ‘n creme. The chunks of cookie weren’t too big, but there was enough that you got one in every bite. J tried to share her cone with me, but I just ended up making a mess of myself. I first tried to use my spoon, but I was afraid I was going to knock the ice cream off the cone. She let me take a bite from the cone and I ended up with ice cream on my nose and cheek. 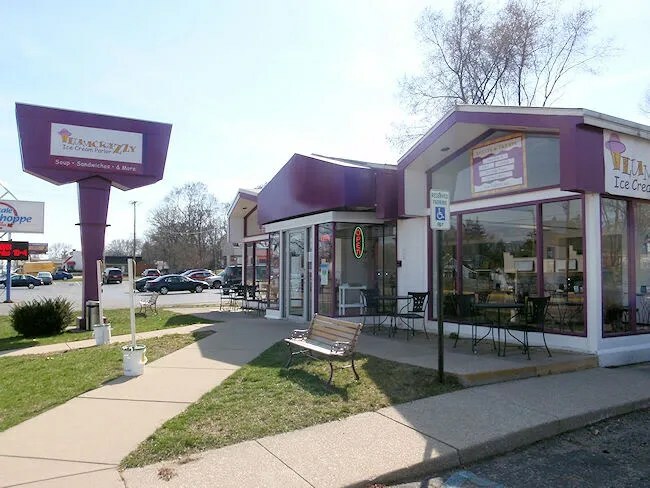 If you’re looking for scoops of ice cream, Plumcrazzy is a lot closer for those of us on the south side of Kalamazoo than driving out to Plainwell. I’m more of a fan of soft serve, but some days, flavored ice cream just hits the spot. Today was one of those days. 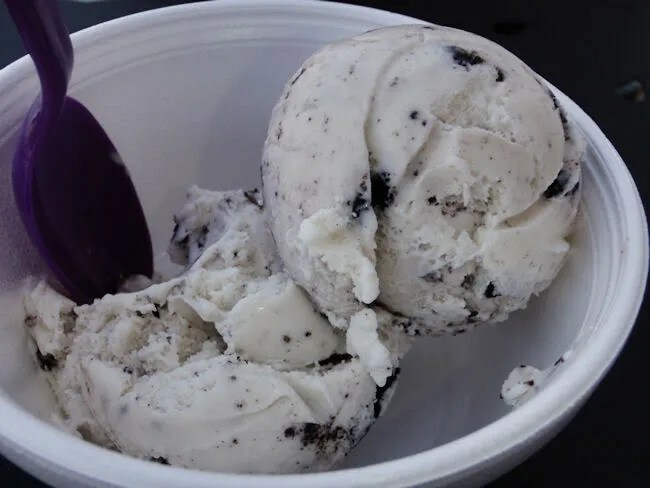 A bowl with Oreo ice cream.